When the application forms for GGSIPU CET for 2012 are coming? What is the eligibility for the entrance test? I am in last year and my results are awaited will I be able to sit for 2012 CET? How can I apply for CET 2012? When will GGSIPU start distributing application forms? How can I apply for CET 2012? What is the last date for submission of the application forms? When will GGSIPU declare the result of CET 2012? When will GGSIPU start distributing application forms? What is the application fees for GGSIPU CET, from where can I download the application form and what is the process of submission of application form? What is the date of GGSIPU CET 2012? What is the syllabus of this exam? Who can apply for this exam? What important documents are to be attached with application from? What are the courses offered by Guru Gobind Singh Indraprastha University for session 2012? Can somebody give me the eligibility to apply for GGSIPU CET 2012? I am interested in doing BCA from this university, pls provide me the details? I am interested in doing master of Mass Media from Guru Gobind Singh Indraprastha University, for that I suppose I need to appear in GGSIPU CET. Please tell me the complete details about GGSIPU CET 2012, when the application process is going to start and when the exams will be conducted? Guru Gobind Singh Indraprastha University is also famous name GGSIPU and it was launched through the Govt of NCT of Delhi and is accredited by UGC. It has invites all the applicants who are interested in taking admission in following undergraduate degree courses offered by the university. The common entrance test covers all abstract and multiple types of question. Interested candidate may also get information about GGSIPU 2011 following undergraduate degree admission application forms, eligibility and selection process related on Guru Gobind Singh Indraprastha University official website. The Guru Gobind Singh Indraprastha University has published notification for CET 2012 for admission in various Undergraduate and Post graduate Programmes and eligibility criteria is different for various programs. I have the the link for admission brochure for previous year and sharing the same for you, feel free to download it, if it is of your use. â€¢	Go to the official website of the Guru Gobind Singh Indraprastha University, Delhi (India). â€¢	Then click on the â€œAdmissionâ€� option, â€œOnline Application For CET -2014â€�. â€¢	Now click on the â€œApply Onlineâ€�. 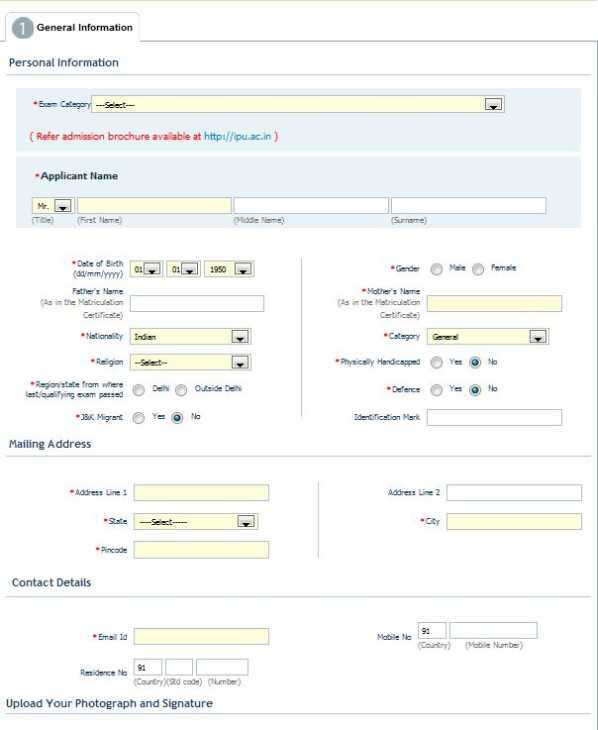 â€¢	This is the page from where you can fill the application form online. All times are GMT +6.5. The time now is 05:40 PM.